The motor examination includes assessment of body position, strength, tone, involuntary movements, coordination, and gait. Strength is graded as follows: 5—Normal. 4—Weak but can overcome gravity plus some additional resistance. 3—Can overcome gravity but not additional resistance. 2—Can move joint but cannot overcome the force of gravity. 1—Muscle contracts, but with little or no joint movement. 0—No muscle contraction. Muscle tone is tested by passively flexing and extending the arm or wrist. Abnormal responses include spasticity, rigidity and flaccidity. Spasticity refers to increased muscle resistance when the muscle is passively stretched. This is seen with lesions to the cortical spinal tract. Rigidity or cogwheeling is observed with extrapyramidal lesions and Parkinson's disease. Flaccid refers to the absence of muscle tone. Muscular weakness can result from upper motor neuron (UMN) lesions, lower motor neuron (LMN) lesions, muscle disease, neuromuscular junction disorders, or functional weakness. UMN disease is characterized by increased tone and reflexes, whereas LMN disease presents with wasting, fasciculations, decreased tone, and absent reflexes. With neuromuscular junction disorders, the patient complains of fatigable weakness but has normal or decreased tone and normal reflexes. A patient with functional weakness has normal tone, normal reflexes without wasting, and erratic power. The motor examination also includes observation for any abnormal movements, including tremors, choreiform movements, myoclonus, and dystonia. Gait should be examined, even if assistance is needed. Assessment includes stride length, arm swing, posture, and turning, starting and stopping. Watch for specific gait abnormalities, such as hemiplegia, which is seen with unilateral UMN damage; spasticity, in which both legs have UMN lesions; steppage, in which there is footdrop; waddling, caused by weakness of the trunk and pelvic girdle; and parkinsonism, characterized by a stooped posture, short steps, and flexed arms with decreased arm swing. Balance is maintained by the cerebellum, proprioceptive system, basal ganglia, and vestibular system. The Romberg sign is tested with the patient standing with feet together and then with eyes closed. If the patient falls with eyes closed, the test is considered positive. A positive test indicates pro-prioceptive loss, which can be from a peripheral cause or a posterior column lesion. The Romberg test can be positive with cerebellar or vestibular disease. Postural stability can be checked by gently pushing the patient while the feet are together. Coordination can be tested with simple tests. For the finger-to-nose test, ask the patient to extend the arm, touch the tip of the nose, and then touch the examiner's index finger. This is repeated after the examiner has moved the index finger several times. 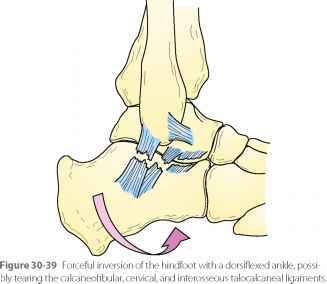 The heel-knee-shin test is performed by asking the supine patient to slide one heel smoothly down the opposite leg from knee to shin. Two other tests of coordination are finger tapping and rapidly alternating hand movements. Injury to the cerebellar hemisphere impairs smooth coordination of limb movements on the same side of the body. With cerebellar lesions, these tests will be inaccurate, will have increased amplitude, and will be initiated more slowly.